This blog post is authored by Warren Mercer and Paul Rascagneres. Ben Baker and Matthew Molyett contributed to this post. The Winter Olympics this year is being held in Pyeongchang, South Korea. The Guardian, a UK Newspaper reported an article that suggested the Olympic computer systems suffered technical issues during the opening ceremony. Officials at the games confirmed some technical issues to non-critical systems and they completed recovery within around 12 hours. Sunday 11th February the Olympic games officials confirmed a cyber attack occurred but did not comment or speculate further. Talos have identified the samples, with moderate confidence, used in this attack. The infection vector is currently unknown as we continue to investigate. The samples identified, however, are not from adversaries looking for information from the games but instead they are aimed to disrupt the games. The samples analysed appear to perform only destructive functionality. There does not appear to be any exfiltration of data. 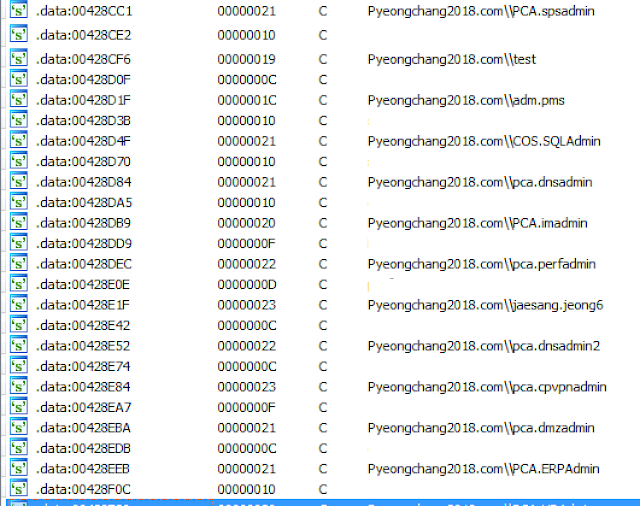 Analysis shows that actors are again favouring legitimate pieces of software as PsExec functionality is identified within the sample. The destructive nature of this malware aims to render the machine unusable by deleting shadow copies, event logs and trying to use PsExec & WMI to further move through the environment. This is something we have witnessed previously with BadRabbit and Nyetya. The initial edb1ff2521fb4bf748111f92786d260d40407a2e8463dcd24bb09f908ee13eb9 sample is a binary that, when executed, drops multiple files on to the victim host. These files are embedded as resources (obfuscated). These files are named using randomly generated file names, however, the hashes of the file when written to disk is the same during our analysis on multiple instances. Currently we are not aware of the initial infection vector used. This could have been delivered in a multitude of ways as it is simply a binary file. Two of the dropped files (the stealing modules) are executed with 2 arguments: 123 and a named pipe. The named pipe is used as a communication channel between the initial stage and the dropped executable.The technique was used during BadRabbit & Nyetya. By WMI (using WQL) with the following request: "SELECT ds_cn FROM ds_computer". This request attempts to list all the systems within the current environment/directory. The purpose is to copy the initial stage to the remote system in %ProgramData%\%COMPUTERNAME%.exe and to execute it via a VBScript. The credentials have not been hardcoded into the binary by the attackers themselves. 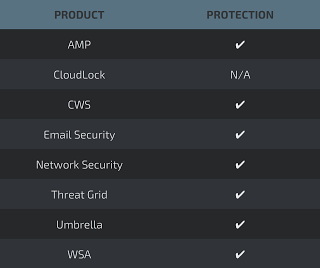 The malware dynamically updates this list after using the password stealers. A new version of the binary is generated with the newly discovered credentials. This new binary will be used on the new infected systems via the propagation. This feature explains why we discovered several samples with different sets of credentials that were collected from previously infected systems. 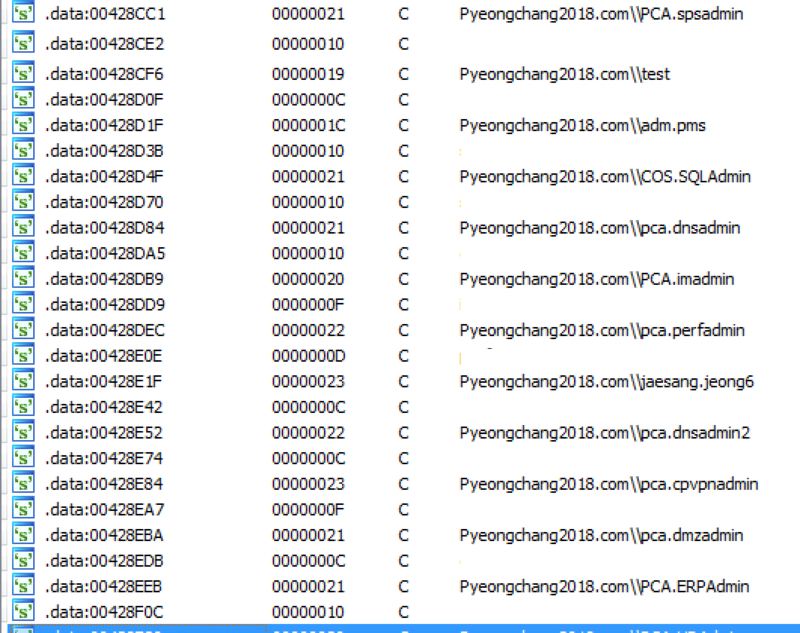 As you can see, the domain attempted to be used is related to Pyeongchang 2018. We identified 44 individual accounts in the binary. Next, again leveraging cmd.exe execution on the host we can see the author using wbadmin.exe, for those not familiar with wbadmin, this is the replacement for ntbackup on modern operating systems. This step is executed to ensure that file recovery is not trivial - WBAdmin can be used to recover individual files, folders and also whole drives so this would be a very convenient tool for a sysadmin to use in order to aid recovery. The next step the attacker takes in this destructive path is to, again leverage cmd.exe, but this time use bcdedit, a tool used for boot config data information, to ensure that the Windows recovery console does not attempt to repair anything on the host. The attacker has now attempted to ensure that recovery is extremely difficult for any impacted hosts and to further cover their tracks the deletion of the System & Security windows event log is performed, this will be used to try and make any analysis more difficult. Wiping all available methods of recovery shows this attacker had no intention of leaving the machine useable. The purpose of this malware is to perform destruction of the host, leave the computer system offline, and wipe remote data. The malware uses the ChangeServiceConfigW API to change the start type to 4 which means: "Disabled: Specifies that the service should not be started." Additionally, the malware lists mapped file shares and for each share, it will wipe the writable files (using either uninitialized data or 0x00 depending of the file size). Finally after modifying all the system configuration, the destroyer shutdowns the compromised system. Additionally, the Olympic Destroyer drops the legitimate, digitally signed, PsExec file in order to perform lateral movement by using this legitimate tool from Microsoft. This is another example of an attacker leveraging legitimate tools within their arsenal. 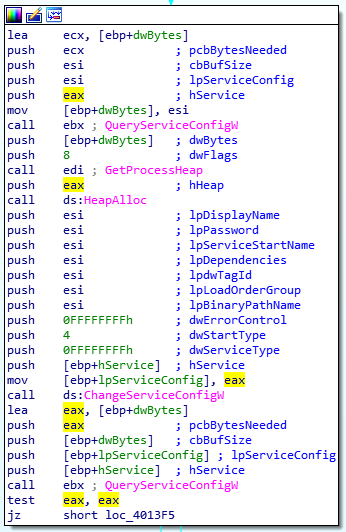 Using legitimate tools like PsExec will save the adversary time from writing their own tooling. A free alternative they can wrap up within their own malware is a much easier option in this instance. During destructive attacks like this there often has to be a thought given to the nature of the attack. Disruption is the clear objective in this type of attack and it leaves us confident in thinking that the actors behind this were after embarrassment of the Olympic committee during the opening ceremony. Disruption of services included the Olympic website being offline, meaning individuals could not print their tickets. The opening ceremony reporting was degraded due to WiFi failing for reporters on site. The malware delivery mechanism is currently unknown which means the infection vector could be a multitude of options, but, if the attacker already had access to the environment, this attack could have been carried out remotely. This would allow the actors to specifically pinpoint the moment of the opening ceremony and would allow them to control their time of impact.